Shravana Belagola was on my wishlist for long, but couldn't manage to visit this place earlier. Shravana Belagola is a small deviation from Hasana-Bengaluru highway but on my previous rides I usually ran out of time to explore this temple town. Shravana Belagola is located closeto Chennarayapattana town of Hasana district. It is about 150 kms from state capital Bengaluru. The Bahubali (popularly known as Gomateshwara) statue here is one of the most sacred centres for Jain community. The Bahubali statue is 58 feet tall and is carved out of single stone, making it the tallest monolithic statue of Bahubali. It is said to be the tallest monolithic statue in the world. Built in 981 AD by Chamundaraya. (Second popular Bahubali statue in Karnataka is near Karkala in Udupi district). Shravana Belagola complex consists of two hills- Chandragiri and Vindhyagiri. The Vidhyagiri hill, the main one (on which Bahubali is erected) itself is about 3300 ft in height. Besides the statue Vidhyagiri also houses a Basadi and temples- namely Odegal Basadi, Siddhara Basadi, Chennana Basadi, Akhanda Bagilu and so on. This surrounding area is called Suttalaya, built/improved continuously during various kings who ruled the land- Hoysala Kings, Mysore Wodeyars and others. Small size status of various Jain Thirthankaras are positioned all around the Gomateshwara statue. The Gomateshwara statue is covered by the outer walls of the temple complex- because of this, the statue is not visible from a distance. Only once you go inside you will get full picture. Only a glimpse of it visible from top of Chandragiri as well. Above: Thyagada Kamba. Over 800 inscriptions are intact in Shravana Belagola area. Watch-out for people trying various jugaad ways to get down effortlessly... Like this gentleman who is trying to slide down on the metal rod handrail, without having to use his legs. 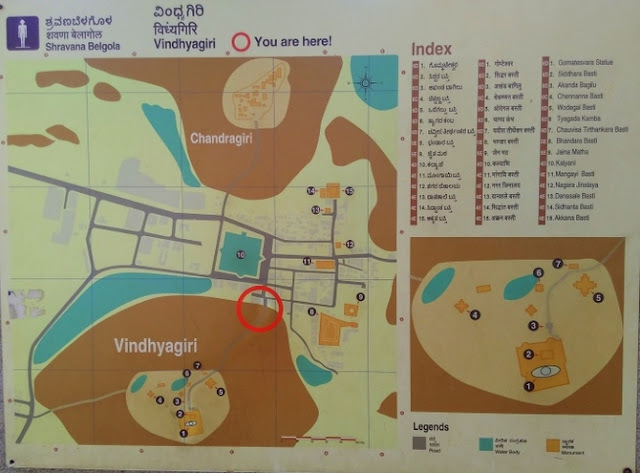 In between Chandragiri and Vidhyagiri lies the Shravana Belagola town. The pushkarini or pond lies in the middle but access was closed. No entry fee to visit Vidhyagiri. Chappal stand charges Rs 5 per pair. Locker facility available for small to medium size bags. You need to climb up without footwear- wearing socks might help. Merchants will attempt to sell you a pair of cheap socks for Rs 20 or more. At 3.30 PM, the rock was not really hot and I could manage bare foot. Use your discretion. Shravana Belagola makes an ideal one day trip from Bengaluru. Should you wish to stay basic accommodation options are available in Shravana Belagola. Entry closes by 5 PM. Need to be back by 6 PM latest. Maha Mastakabhisheka- Every 12 years, the celemony of Maha Mastakabhisheka is performed. This is a ritual involving cleansing the statue and performing Pooja with sugarcane juice, Turmeric, Sandalwood paste, flowers, milk, ghee and other liquids. Next Maha Mastakabhisheka is due on Feb 2018. If you are returning to Bengaluru from Hasana/Chikmagaluru etc Shravana Belagola is nice deviation. So you found tender coconut there! After that I am sure your climb was easy! What a beautiful place !!!!!!! loved the architectural works, a lovely place. Your blog-post brought back childhood memories, when I had visited Shravan Belagola in 7th standard. Now it looks more clean and less crowded. Nice post, Shrinidhi. It's been a while since I went there. Should plan sometime soon. Have read a lot about Bahubali and seen many tv broadcasts which show their Auspicious Annual Abhishek functions with large amount of Milk , Honey etc but you showed the Inside story Superbly ! Shravana Belagola makes an ideal one day trip from Bengaluru. Should you wish to stay basic accommodation options are available in Shravana Belagola. Beautiful place to visit .